Every so often Alexandre Liaume opens his front door to find people dressed in leather jackets picnicking across the road or taking selfies on the doorstep. Very occasionally a guitarist serenades him from the street or someone peers through the letterbox. Luckily though, these incidents are rare and Alexandre takes it all in his stride. It’s the legacy of living in an apartment once rented by the Libertines’ guitarist Pete Doherty. The 80 sqm apartment was dark, very cluttered and not particularly well laid out. The bathroom was directly off the main living area and a heavy spiral staircase lead to two bedrooms upstairs. 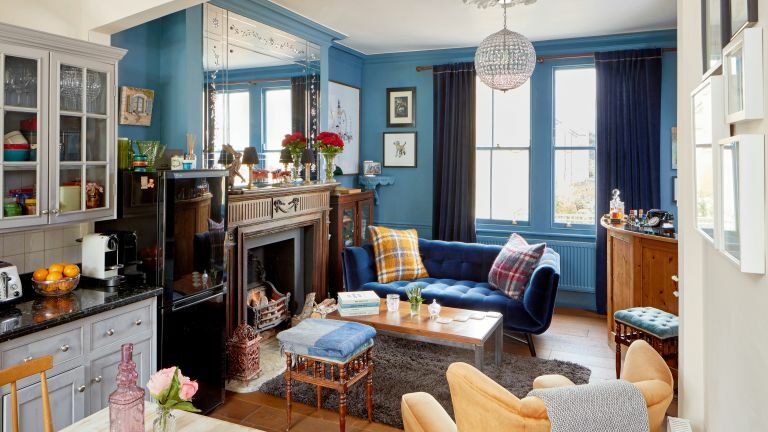 Having already refurbished a tiny two-bedroom flat, Alexandre was confident that the move into a larger, unmodernised property, in a trendier area of east London, would pay dividends. Alexandre knew, just by looking at the agent’s photographs, how he would change and update the apartment. He would move the bathroom upstairs, turn the old bathroom into a guest room/office/ music room and make every inch of space count in the compact property. He moved in after a long purchase process and got a builder to strip out the bathroom so he could set up camp in there as the rest of the apartment was renovated around him. ‘For the first month I had to shower at friends’ houses, and use a ladder to get to the loo because the previous owner had taken the spiral staircase and it took me a while to replace it,’ he says. As a designer, Alexandre is used to seeing the bigger picture however, and during the five-month renovation project he replaced the carpeted floors with various types of wooden alternatives, designed the new bathroom to include a whirpool bath and hammam, and had the staircase made and fitted to his own measurements – ‘It was scary, but it saved me a fortune doing it this way,’ he says. He also had all the plaster removed on the stair wall to expose the original multicoloured, workshop bricks and turned a cluttered rooftop terrace into a chic outdoor living area with sofas, upturned decking, table and chairs, and planting. Alexandre’s style is influenced by his French roots, his passion for English vintage and antique furniture, and a love of graphic art. Alexandre has maximised the limited space, adding shelves in alcoves and over doorways, linking the outdoor terrace to the inside and creating multi-use living areas. The open staircase and narrow French-style doors between room – which are often left open – take the eye from one area to another to create a sense of light and space. The finished look soon led to requests for help from friends and colleagues and Alexandre has now made the leap from digital product management to interior design, retraining and transferring his skills to work on commercial and private projects with his company Alexandre Interiors.